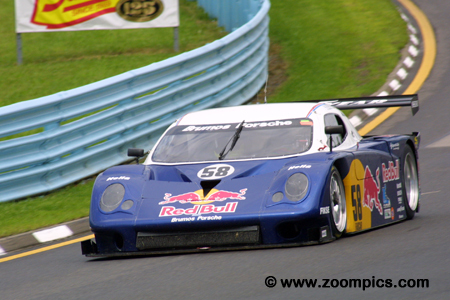 Watkins Glen International was race six of the twelve rounds contested during the 2003 Grand-Am championship. It was one of the longer events on the schedule at six hours in length. The first six-hour contest was held in 1968 for the International Championship of Makes. The endurance race, was an annual event until the track encountered financial difficulties in 1982. With new ownership in place, the facility began hosting shorter endurance events, until 1996 when the six-hour race returned and became a permanent fixture on Watkins Glen’s Calendar. 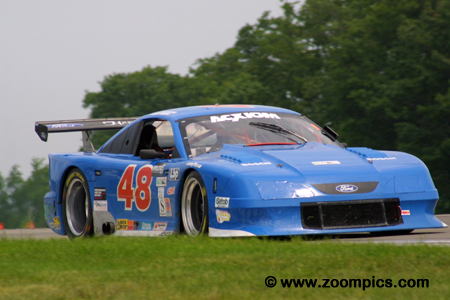 In 2003, the first year of the class restructuring, it was difficult for the Grand Am series to achieve the same number of entries as they had in previous years. 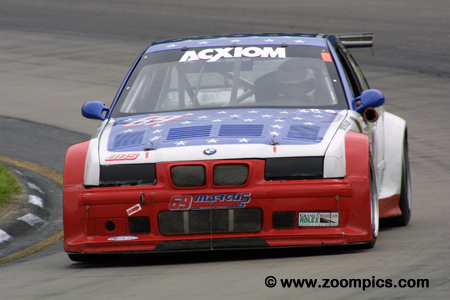 To improve the situation, the grids were supplemented with cars from the Grand Am Cup championship. 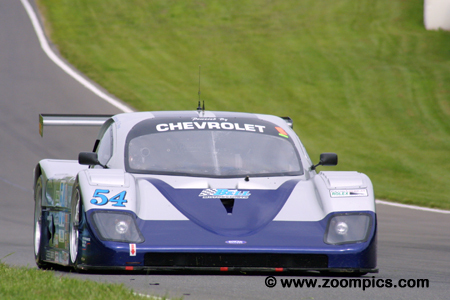 There was a total of twenty-five entries at Watkins Glen (5-Daytona Prototypes, 2-Sportsracing Prototype IIs, 5- GTS and 13-GT – nine of which were from the Grand Am Cup series). The event was impacted by steady rain on Saturday. This weather condition caused Grand Am officials to cancel qualifying and the grid for the race was determined by Owner’s points. With a few exceptions, the starting line-up was similar to the practice times posted by competitors. 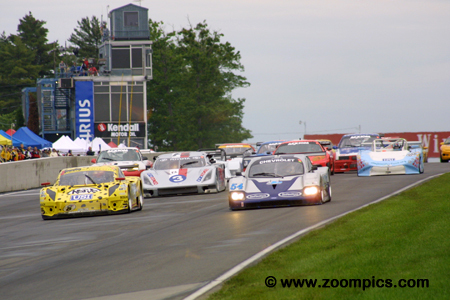 Twenty-five cars head in to Watkins Glen’s first corner for round six of the 2003 Grand Am Championship. Leading the field are the No. 8 Picchio of G&W Motorsports and from Bell Motorsports the No. 54 Doran. The Brumos Racing Fabcars were supposed to start on the front row but a delay to changing tires and a tire penalty forced them to start from the rear of the grid. Sharing the driving duties, in the No. 58 Brumos entry, with the David Donohue and Mike Borkowski was, Scott Goodyear. As the grid was determined by Owner points, the trio was scheduled to start on the outside of the front row but they were at the rear of the field due to a tire penalty. At the end of six hours, it was a duel between the No. 58 Fabcar and Bell Motorsports Doran. A late race caution allowed Goodyear to make a pass in turn one on the No. 54 Doran and take the victory. As a result of the Grand Am qualifying rule, the No. 54 Bell Motorsports Doran JE4 entry started fourth. Sharing the car were Terry Borcheller, Forest Barber and added for the six-hour event was sports car veteran, Didier Theys. The race was dominated by the No. 58 Brumos and Bell Motorsports entries. The final caution period bunched the field and when Theys was blocked by a slower car Scott Goodyear took the lead and win. The Heritage Motorsports Ford Mustang was gridded eighth and was driven by Tommy Riggins, David Machavern and Scott Lagasse. The GTS class was a race of attrition. The Mustang developed a transmission issue early in the contest but it was replaced – costing the team a number of laps. But this problem was not as terminal as that of their competition and they won the GTS category. 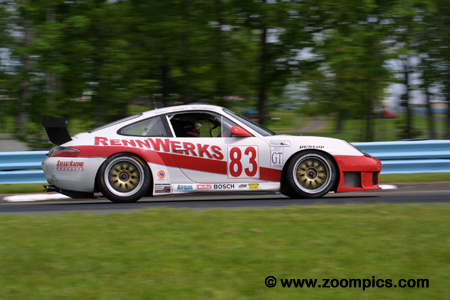 Rennwerks Motorsports entered the No. 83 Porsche GT3RS. 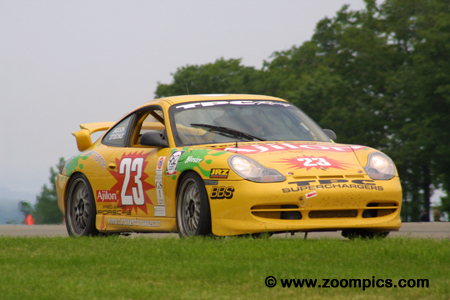 The Porsche was driven by Johannes van Overbeek, Seth Neiman and Lonnie Pechnik and started eleventh overall. Van Overbeek was behind the wheel for the last stint and a late race caution period allowed him to take on new tires. With the added grip, he was able to catch and pass the class leading Ferrari and win the GT category by over seventeen seconds. 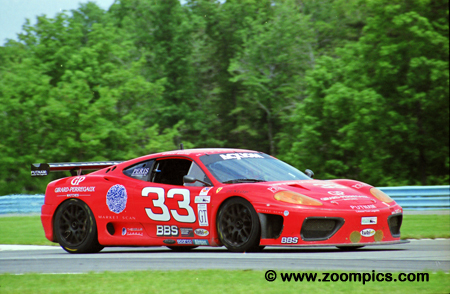 Leading the GT class points chase were Brent Martini and Cort Wagner in the Scuderia Ferrari of Washington Ferrari 360 GT. By virtue of the Owner points, Wagner was in the seventh grid position. 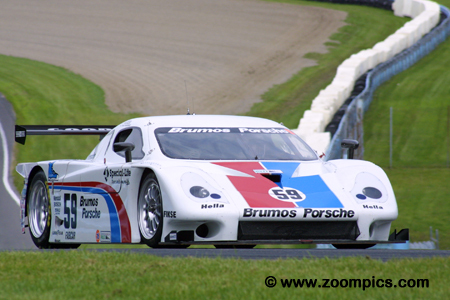 The final five laps was a battle between Martini and Johannes van Overbeek in the Rennewerks Porsche. With fresher tires, van Overbeek was able to pass Martini. The Ferrari finished fourth overall and second in class. There were only two entries on the Sportsracing Prototype II class. Essex Racing entered a Lola B2K/40 and the No. 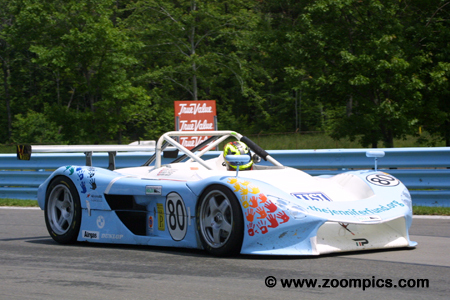 80 BMW-powered Picchio was from the G&W Motorsports stable. In the fourth hour of the race, the two cars collided which resulted in the retirement of the Lola. The Picchio, driven by Steve Marshall, Robert Prilika and Shawn Bayliff, was able to continue and finished eleventh overall and first in class. Starting fifteenth overall and fifth in the GTS class was the Team Re/Max Racing Chevrolet Corvette. Sharing the Corvette were a trio of west-coast NASCAR competitors - John Metcalf, Davy Lee Liniger and Rick Carelli. The Corvette was in the class lead when it retired after 114 laps with a connecting rod failure. Darius Grala and his Cegwa Sport team returned to the series – not participating since round two at Homestead-Miami Speedway. Driving the Toyota-powered Fabcar FDSC/03 were Grala, Guy Cosmo and R.J. Valentine. Early in the race, the car encountered fuel pump problems but it was replaced and they were able to continue. In the closing stages of the contest, the car developed a transmission issue but the team held on to finish third in the Daytona Prototype category. Chris Dyson was recruited to help series regulars, Hurley Haywood and J.C. France drive the No. 59 Brumos Racing Fabcar FDSC/03. With the cancellation of qualifying, the No. 59 Fabcar was scheduled to start on the pole but they joined the race from the pit lane after changing tires. On lap 120, Dyson was in second place when he slid off the track in turn ten – the result of the leading GTS car losing an engine. The damage to the Fabcar was extensive and the team retired. Entering Watkins Glen, Hugh Plumb and Brian Cunningham were just four points behind the GT class leaders. Added to the driver lineup for the Watkins Glen event was Frenchman Gilles Vannelet, the 2000 Renault Megane Cup Champion. The No. 69 BMW was running second in class when it broke an axle and lost six laps while repairs were made. The team was able to salvage a third in the GT category. The original G&W Motorsports driver lineup included Darren Law plus local NASCAR stars Geoff and Brett Bodine. Unfortunately, Brett was injured the previous weekend and was replaced by Andy Lally. Based on the Owner’s points, the Picchio was gridded third for the start but with the Brumos cars missing they were on the pole. A combination of clutch and handling problems challenged the team during the six-hour event. However, they completed 149 laps and finished fourth in class. 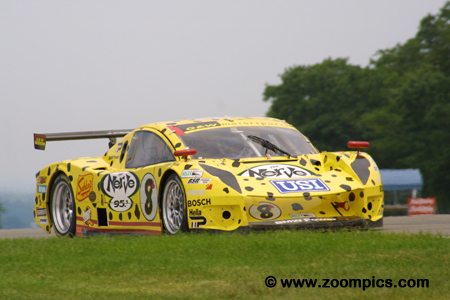 The introduction of the Daytona Prototype class and a realignment of vehicle eligibility in the other categories reduced the car counts at the 2003 Grand Am events. 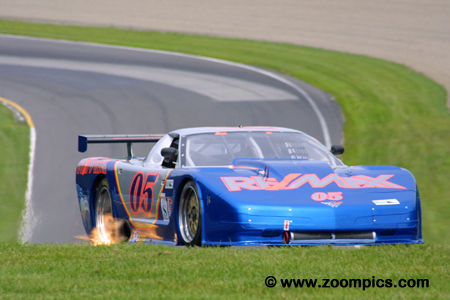 To enhance the grids, Grand Sport I cars from the Grand Am Cup division were encouraged to compete in the GT category. At Watkins Glen, there were nine such entries. The No. 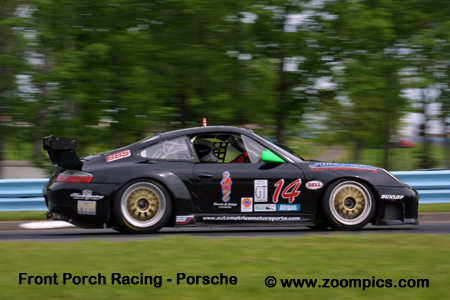 23 Porsche from TPC Racing finished seventh overall and fourth in the GT class.